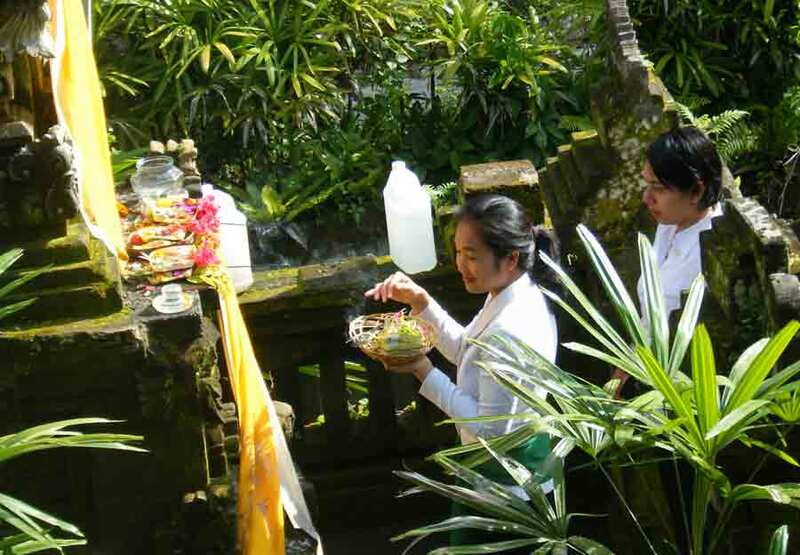 As we were wending our way to the breakfast buffet this morning, we watched two of the hotel staff performing their religious rituals. There are many shrines in the hotel grounds, as well as a large temple and these devotions are held at each one. We were glad the priest had shown us the proper manner in which to pray and that Madu had explained why for us. After breakfast we set out to watch the drama of the Barong and Kris dance. This was more drama than dance, but was indeed spectacular. The explanatory notes we received were a little peculiar, so I will try my best to tell you about the story. The play represents to eternal struggle between good and evil. 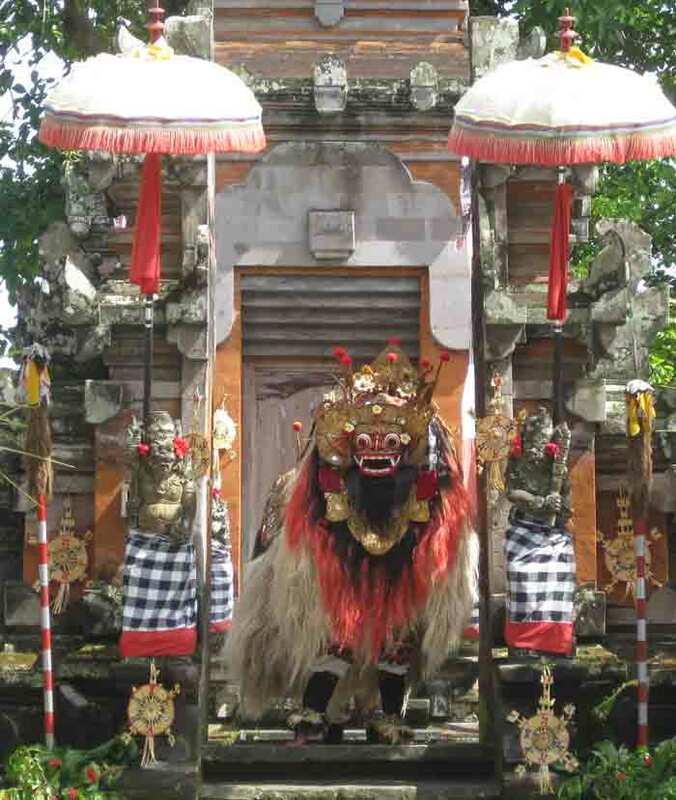 Barong (a mythological animal) represents good and Rangda( a monster) represents evil. The play begins with a struggle between three frightened palmwine growers and the barong and his friend, the monkey. In the struggle one of the palmgrowers has his nose bitten off. Two girls, servants of the Rangda appear, looking for the servants of Dewi Kunti who are looking for the prime minister. One of the Rangda's servants becomes a witch and makes both of Dewi Kunti's servants angry. Dewi Kunti and her son, Sadewa, arrive. Dewi Kunti has agreed to sacrifice her son to the Rangda and he is tied to a tree after a witch makes dewi Kunti angry. Then Siva, the god, arrives and gives Sadewa immortality. The Rangda tries to kill Sadewa, in vain. The Rangda repents, is killed by Sadewa and goes to heaven. One of Rangda's servants tries to receive redemption as well, but is refused by Sadewa; she becomes angry, changes into a boar, and, after defeat in that form, into a bird. After another defeat, she becomes a Rangda herself and Sadewa becomes a Barong. Followers of the Barong appear to help Sadewa. At one point the Rangda enrages these men and they try to kill themselves with their krises. In the end, the Barong prevails. As you can see, the plot is quite complicated but made for wonderful dramatic theatre at the outdoor temple. 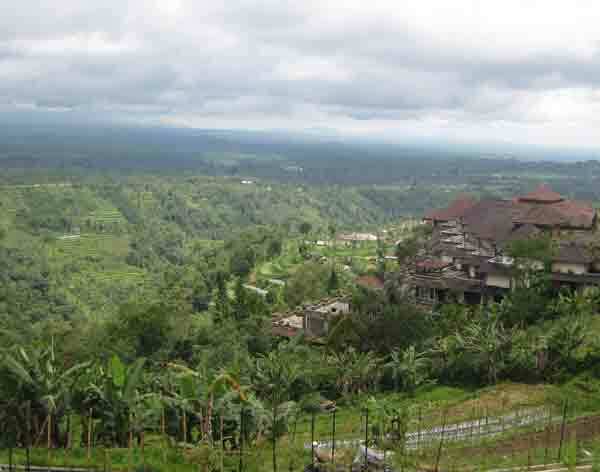 We then toured through the countryside, obsering the rural way of life typical of most of the inhabitants of Bali. Many people were dressed to go to festivals at the local temples. However, most people were working in the rice terraces. We did not visit the huge ones where most tourists go, but watched farmers plowing and planting young rice plants. Fields of chrysanthemums are grown simply for the daily offerings to the gods. Ducks and geese searched for food in the rice fields. 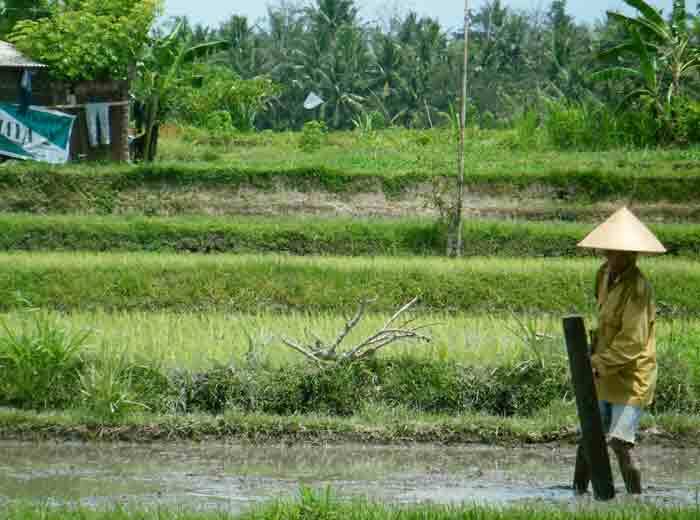 a farmer working in his rice fields. The rice grown locally is red, tastes somewhat like brown rice, but is not exported. 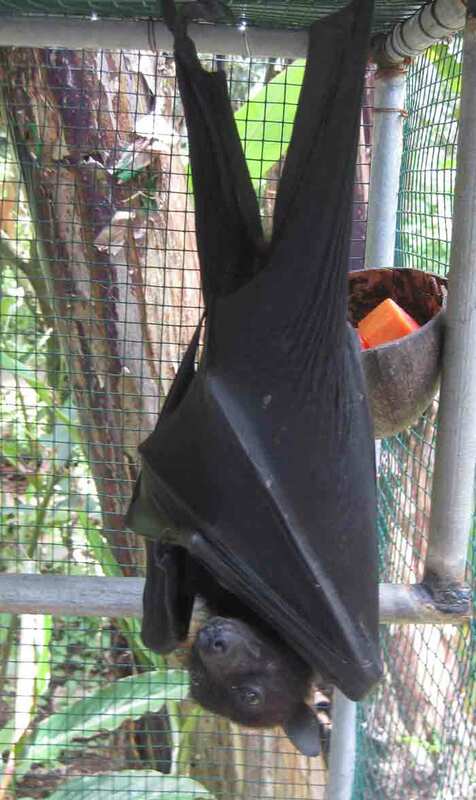 It stays in Bali. We stopped for lunch is a small village and ate local food- red rice, suckling pig, tea and dessert- for $6.00 for the three of us! 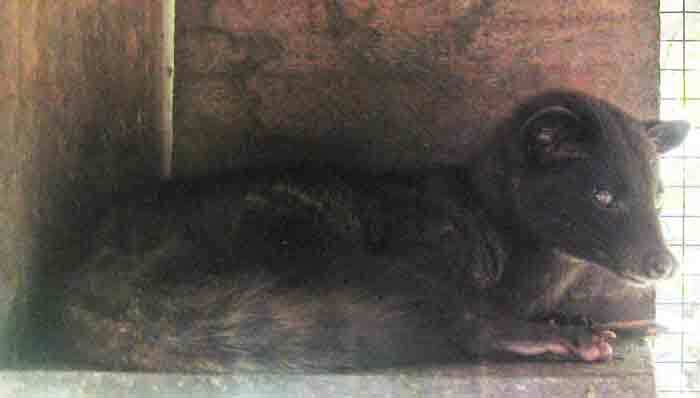 a civet cat, known locally as a luwak. I wondered what was the significance of this civet and was informed that the luwak eats coffee berries whole and passes them through its digestive system. 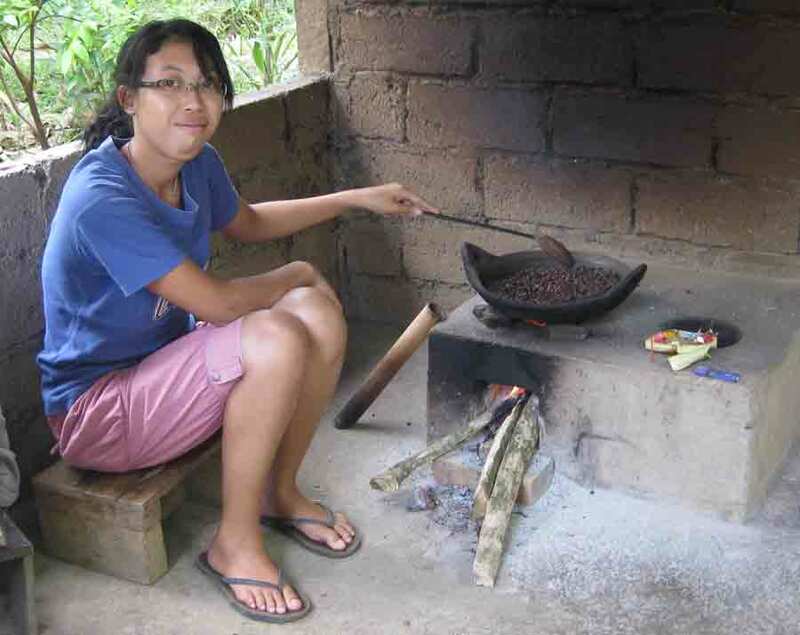 When they are evacuated, the berries are cleaned, roasted over a wood fire and ground with a huge mortar and pestle into luwak coffee, which is apparently very chocolatey in flavour. It is very expensive, but I purchased some for Dave. I am SURE he has never had THAT before!!!! As we were leaving, some schoolchildren returning home for the day caught our eye. As the afternoon wore on, we realized we needed to buy some fuel for the car. However, nearly all the service stations seemed to be empty. 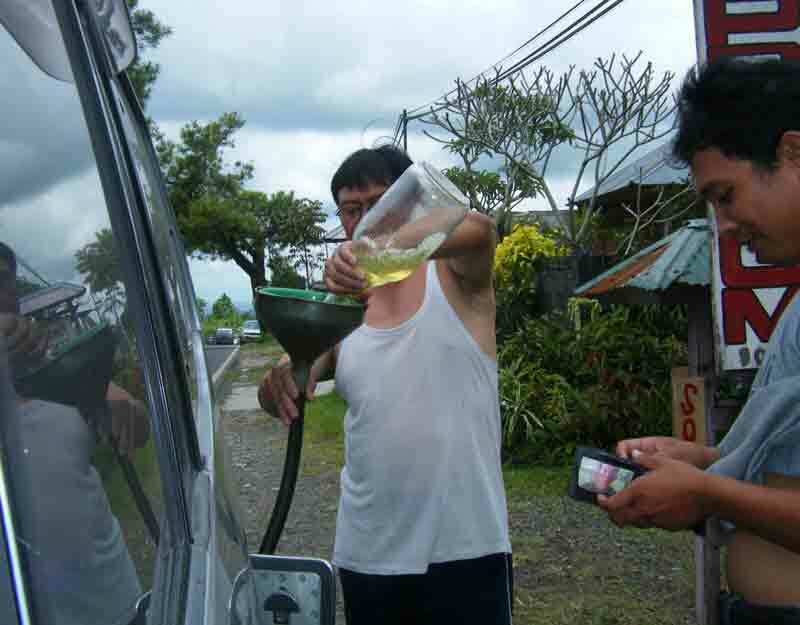 It was necessary to top up the tank enough to get back to the marina the expensive way. Local stalls all have bottles of petrol for sale, primarily for the hundreds of motor scooters. It's not sophisticated, but it works! Our last stop of the day was up to a lake, we have no idea where. On the way we stopped to admire the mountain view. Under the plastic in the foreground are strawberry plants. The lake was beautiful, probably a volcanic tarn. There are Hindu shrines as well as a Buddhist temple. Most of the visitors were local people. Sara and I were delighted to be able to buy batik dresses (with a lot of the gold paint) for $6.00 each ($8.00 for a long one). The beauty and peace here made it very difficult to return to our grotty marina. (Unfortunately, the ONLY marina in Bali). However, we had such wonderful memories from even such a brief visit.